building my empire on a Polly Pocket sized scale. Shredded pork is one of my very favorite things. It is super easy to make, can be used in many different ways, and has delicious flavor. This recipe for shredded pork turns a low-cost cut of pork into a flavorful base that is good enough to stand up on its own, and with the addition of a few ingredients can turn into loads of other meals. It is better the second day, and freezes well. It is basically the king of versatility. In this recipe, I’ve kept the ingredients pretty simple – a pork roast, liquid, and a seasoning blend. I like Montreal Seasoning, but have also used other spice blends with great success. The key to this recipe is to cover it and let it cook all day, then shred it once it falls apart. I separate the cooking liquid to remove most of the fat, then add a bit of flavoring at the end. I prefer to make this a day ahead and reheat it just before serving. It is excellent for a crowd, especially when made the day before so you can get all of the work out of the way and simply reheat. 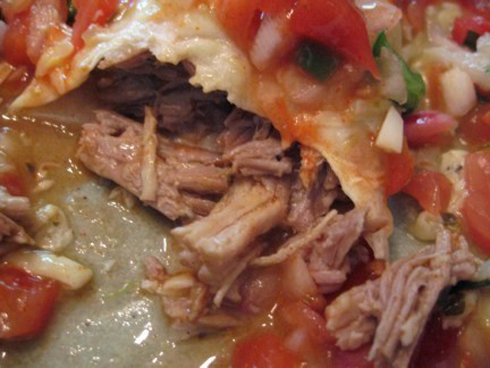 – Enchiladas: Roll up inside a tortilla, place in baking dish, pour green enchilada sauce over the top, add shredded cheese, bake for 30 minutes at 350 degrees. Top with pico de gallo. Rub Montreal Seasoning on the outside of the pork roast. Place roast fat side up in the crock pot, and cook on low for 8 hours or until it pulls apart with a fork. Remove roast and set aside. Pour remaining liquid into a fat separator, and let sit until the fat rises to the top. Shred pork roast with two forks, discarding any bits of fat. Return to the crock pot. After the fat and liquid have separated, return only the liquid part to the crock pot. Add enough liquid to cover. Add ketchup, mustard, and vinegar. Stir and set crock pot to warm until ready to serve.